A recent report on “Big Data” searched transcripts for more than 5,000 companies contained in FactSet’s database and revealed Big Data had been mentioned during 841 conference calls and investor presentations this year. That’s up 43% from the 589 calls and presentations it featured in last year, a much larger increase than any other corporate buzzword. In comparison, “The Cloud” was featured on 1,356 calls and presentations and was up less than 2% from last year. Just when I thought the term Big Data had become omnibus, enter Precision Medicine. The implications and heralded uses of Big Data vastly varies, from tackling global networks of sophisticated cyber criminals to targeting and tailoring advertising campaigns to specific market segments. In HCIT, Big Data’s foreshadowed uses are too frequently focused on EHRs. Looking further, Big Data may lead to facilitating huge leaps of advancement, such as Precision Medicine through the rise of genomics and remote patient monitoring technologies. 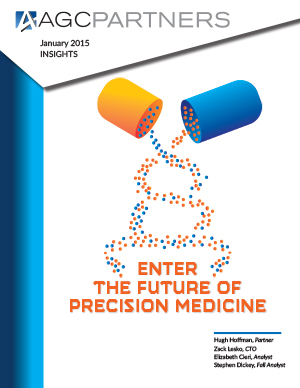 We, at AGC, see great promise and market activity in Precision Medicine as traditional HCIT and life sciences trends continue to converge.